Built by the Umayyad Caliph Suleyman in 717 CE and altered several times, the Great Mosque of Aleppo remains one of the architectural masterpieces of the Muslim world. Built by the Umayyad Caliph Suleyman in 717 CE and altered several times, the Great Mosque of Aleppo remains one of the architectural masterpieces of the Muslim world. Its striking resemblance to the Umayyad Great Mosque of Damascus in terms of plan and architectural forms is one of its key qualities, combined with religious merits emphasised by the presence of the remains of Prophet Zakariyah (peace be upon him) and historical significance expressed through its connection with Emir Nur Al-Din Zangi, the great Muslim commander who fought the crusaders relentlessly. Not long after the arrival of Islam to this once great Roman and Byzantine city its main Friday mosque was built. Sources indicate that the arriving Muslims proceeded to the city's community, mostly Christians, requesting the purchase of the site of a garden of an old derelict church as well as a piece of land from an old cemetery  to build on it the Great Mosque. The choice of this location at the city centre was to express the religious and cultural centrality of this edifice and to symbolise the Muslim sovereignty. In 715 CE, ten years after the foundation of the Umayyad Mosque at Damascus, the Umayyad Caliph Al-Walid engaged in the construction of the mosque that was to equal the former. The unfortunate Al-Walid died before the works were fully completed, leaving the task for his brother and successor Caliph Suleiman (715-717) who completed it in 717 . There are reports which relate that the wise Umar Ibn Abdel-Aziz was put in charge, by Suleiman, to follow and manage the construction project. 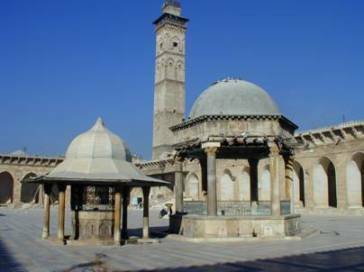 Most scholars twinned Aleppo Mosque with that of Damascus because they share many common features. 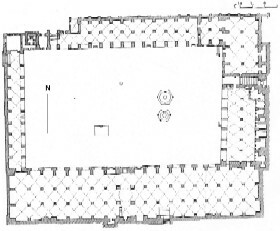 The central location on a Roman/Byzantine site, the hypostyle plan with large marbled courtyard surrounded by porticoes, the presence of the remains of Prophet Zakariyah in Aleppo and those of his son Yahiya (John the Baptist) in Damascus, in addition to the decorative scheme of mosaics (now lost) are some of these elements. 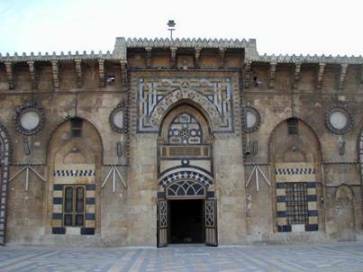 However, unlike the Great Mosque of Damascus which preserved a good number of its original features, Aleppo mosque was subject to successive adaptations and alterations which were often the result of deliberate fire or natural earthquakes. The first calamity to befall the mosque was the arrival of the Abbasids, who blinded by their enmity and revenge against the Umayyads and their legacy, vandalised the mosque and according to Al-Ghazi they stripped it of its carvings, mosaics and other art works which they transferred to their mosque in Al-Anbar in Iraq . However, the historian, Ibn al-Adhim, provided a different story for the disappearance of the mosaics emphasising that it was the Byzantine emperor Nicephorus who when occupied Aleppo in 962 CE sent a wave of destruction through the city completely burning the mosque and destroying the mosaics . The Byzantine occupation was put to an end by the Hamdanids under the leadership of Emir Sayf Al-Dawlah. Under his rule, Aleppo regained its prosperity becoming the political capital of the dynasty and an important cultural centre renowned for two of its great poets; Abu Tayeb Al-Mutanabbi and Abu-Firas Al-Hamadani. As expected, Sayf-Al-Dawlah gave priority to the rebuilding of the burnt mosque. From the little evidence we have, which consists of the courtyard fountain and its dome, the Hamdanid renovation must have been of great magnificence. The Seljuks renovated the mosque at the end of the eleventh century and built the present minaret in 1090 CE. After this, Aleppo entered a difficult period dominated by great insecurity which characterised the region at that time following the arrival of the Crusaders. The mosque was at the centre of these events. For example, it was sacked in 564 AH/1168 CE when the Fatimids took the city , but the famous Emir Nur al Din who regained the city rebuilt it in 1158/1745 CE. A century later (679 AH/1280 CE), an Armenian king by the name of Sisse again conquered the city and burnt the mosque destroying most of the Ayyubid works sparing only the Seljuk minaret. The Mongol invasion was also brutal and once again the mosque was subject to destruction. The Mamluk Sultan Qalawun rebuilt it making many alterations to the original design. As noted earlier, much of the mosque plan dates from Nur al-Din's complete reconstruction in 1158 when it was arranged into a rectangle of about 150m x 100m with a large courtyard in its middle . 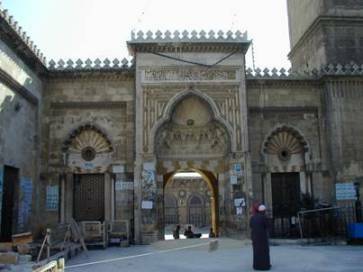 Four gates were pierced into the four sides allowing access into the mosque through the courtyard, apart from the eastern gate which connects straight to the prayer room. The prayer hall is a large arcaded room, three aisles deep running parallel to the qibla wall. The roof is carried by a total of eighty strong piers organised in four rows, mostly introduced by the Mamluk restoration. It was originally flat equipped with a central dome in front of the mihrab, but Qalawun's renovation replaced it with a cross-vaulted system. The beautiful mihrab made of yellow stone was pierced at the centre of the Qibla wall, adding greater holiness to the place. 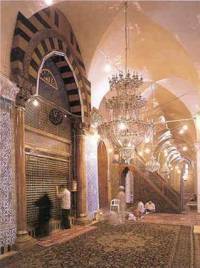 As with the Great Umayyad Mosque of Damascus, on the left of the mihrab is a maqsurah which holds the remains of Prophet Zakariah. Historical sources, from Ibn Shaddad, Ibn Al-Shahna and Ibn Al-Khatib quoting Ibn al-Adhim, tell that the skull of Prophet Zakariya was discovered in Baalbek around 1043 CE (435 AH), then was transferred to Hams and finally settled in Aleppo at the end of the same year. At first it was buried in the city's castle but the fire which was caused by the Mongol invasion in1260 CE (659 AH) forced two local leaders, Abu Bakr Ibn Ilya Al-Nathir and Abu Hamid Ibn Al-Najeeb Al-Dimshaki to rescue the remains and rebury them in their present location in the Great Mosque. The maqsurah was built above them in the form of a square domed room raised by one step above the floor level of the prayer hall, and adorned with beautiful Kashan tiles which cover all the internal surfaces of its walls. Placed in the middle of the room, the tomb appears wrapped in a luxurious robe decorated with silver embroideries containing Quranic verses from the chapter of Mariyam (Mary). The robe was made for the Ottoman Caliph Abdel Aziz Khan in 1874 CE (1291 AH). The room also contains a number of valuable objects including a very old manuscript of the Qur'an. The access to the maqsurah is made through a large arched gate supported on two robust columns topped with capitals adorned with muqarnas. The door is a huge screen made of bronze of golden colour. 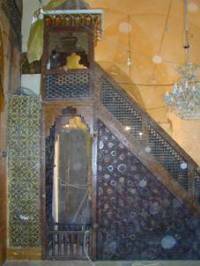 On the right side of the mihrab, there is a beautiful minbar that is thought to have been made by the master craftsman Mohammed Ibn Ali Al-Mausili for the Mamluk Sultan Qalawun who ordered it to be made especially for the mosque. It is a real master piece made from a local type of wood and decorated with geometrical carvings in the form of stars and five or six sided polygons. 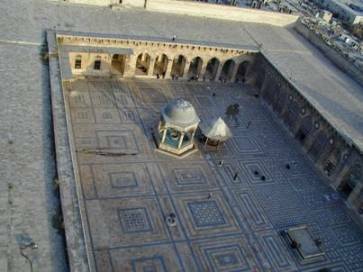 The rectangular courtyard shares many of the features of the Great Umayyad Mosque of Damascus, especially the surrounding heavy masonry arcades and the domed ablution fountains. Its fame is connected to the black and white stone paving organised in complex geometrical patterns. It is worth noting that the function of the courtyard in mosques plays a similar role to that in domestic buildings, as a an important living space, with a constant stream of people coming in as much to relax in the arcades as to pray. At the southern corner stands the Minaret which, as noted previously, was built in 1090 after the original one collapsed. It was the judge Abu Al-Hasan Mohammed  who seeing the dilapidation of the original minaret decided to replace it. For this purpose he recruited a famous architect, Hasan Ibn Mufarraj, from Sermin, a village near Aleppo. Historic sources report that in order to strengthen the foundations, the architect dug deep until he reached water, then set the foundation stones strengthening them with metal and lead brackets. On these robust foundations, he raised the minaret 45 meters high in six sections and with a staircase composing some 174 steps. To define the sections, Hasan Ibn Mufarraj introduced a set of mouldings and calligraphic bands of mixed Kufic and Naskhi script. A number of trefoil and polyfoil arches were finely incised in the first three stages, becoming more elaborate in the following two sections above them . Christian authors claimed that the site was originally a Roman temple, later converted into a church, St. Helena, by the Byzantines. Kamel Al-Ghazi, Nahr Al-Dhahab, the Golden River . See Hattestein Hattstein and Delius (2000) 'Islam Art and Architecture', Konemann, Cologne , p. 175. His full name was Abu Al-Hacen Mohammed Ibn Yahia Ibn Mohammed Al-Khashab. Jairazbhoy R. A. (1972) , ‘An Outline of Islamic Architecture', Asia Publishing House; Bombay, Calcutta, New Delhi, Madras, Lucknow, Bangalore, London, New York, p.163.